Composed by G. Redler. Parlors, Children & adults, Children dancing, Wealth, Servants, Kilts, Manners & customs. Lester S. Levy Collection. 6 pages. Published by Johns Hopkins University Sheridan Libraries (LV.9514). Le Petit Bal `a La Cour (Les Enfans De Brunswick). 2nd Set. (1) La Fete des Enfans de Brunswick; (2) La Fete de Claremont; (3) Le Chasseur de Windsor; (4) La Fete Champetre; (5) Le Chateau de Windsor. 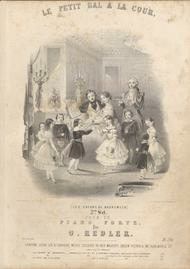 Pour le Piano Forte Par G. Redler. Published [n.d.] by Leoni Lee & Coxhead, Music Sellers to Her Majesty, Queen Victoria, 48 Albemarle St. in London. Composition of five da capo movements with piano instrumentation. Subject headings for this piece include Parlors, Children & adults, Children dancing, Wealth, Servants, Kilts, Manners & customs. The Lester S. Levy Collection of Sheet Music consists of over 29,000 pieces of American popular music. Donated to Johns Hopkins University Sheridan Libraries, the collection's strength is its thorough documentation of nineteenth-century American through popular music. This sheet music has been provided by Project Gado, a San Francisco Bay Area startup whose mission is to digitize and share the world's visual history. WARNING: These titles are provided as historical documents. Language and concepts within reflect the opinions and values of the time and may be offensive to some.